*articles may contain affiliate links* This post about British Soccer Camp is one such post. Do you remember what Evan really wanted to do this summer? He was super excited about spending a week at British Soccer Camp at Pittsburgh Indoor Sports Arena – and he did it! Evan was the third kid to check in, but would have been first if he didn’t have a I HAVE TO PUT MY BRITISH SOCCER JERSEY ON NOW moment in the van once he saw the coaches walking into PISA wearing their jerseys. He was younger than the other two kids and said to me, “good thing I’m small, I’m going to outrun them cause I am so fast from not running in a while”. Hmmph! This was seconds before he pushed me out of the bench area and said to go to work ’cause he was good and settled. Well then, looks like we have a Beckham on our hands?!?! My dad handled camp the rest of the week and he was impressed with the ease, the facility (and staff), and coaches. Evan was exhausted after each day but definitely loved it. On the last day of camp, we took the whole family plus Pappy and Grammie to watch the campers play a game and get their awards. Coaches James and Diego also gave the kids an evaluation – lines right up with what we’ve been trying to work with Evan on. After a week of camp, Evan definitely shows that he loves playing defense over anything (sorry, Coach X, but we think he will try to do some more goalie work soon, too!) and is still all about fairness on the field. He’s looking forward to his fall season at our local Y, but keeps asking if he can do camp again next year! While summer might be coming to an end, there are still some several options for the soccer camp around the country. And keep watching – they’ll be back in Pittsburgh next summer! Want to keep in the know? 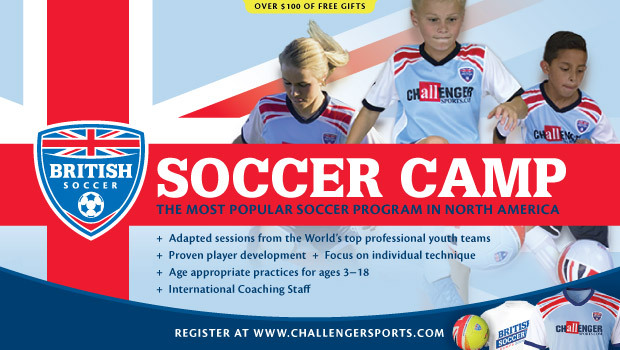 Follow along on Twitter with @ChallengerCamps and be sure to follow @usfg for family-friendly fun near you. What camps did your kiddo participate in this summer? This entry was posted in Evan and tagged soccer, summer camp, us family guide. Bookmark the permalink.